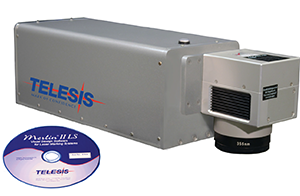 Our strong portfolio already boasts some of the most versatile and reliable systems in the industry, and with the addition of the ultra-compact UVC based laser marker, Telesis has gained flexibility and broadened the reach of applications that can be addressed. Telesis offers an industry leading 18 month warranty on the UVC along with a global support organization. The 355nm UV laser wavelength is versatile in marking a wide range of materials and perfect for "cold marking" applications where heat affected zones are not allowed - the UVC can mark plastics and silicone materials without the need of additives and can also mark glass with a reduced risk of microfracture. The excellent beam quality also affords this laser the ability to be utilized in micro marking applications such as electronics, circuit boards and microchips, in addition to solar panels and precise medical marking applications.